Rosemary or Rosmarinus Officinalis is not just an aromatic herb; it is also one of the most powerful herbs and essential oil. Rosemary is being used in a lot of hair products due to its antiseptic properties. 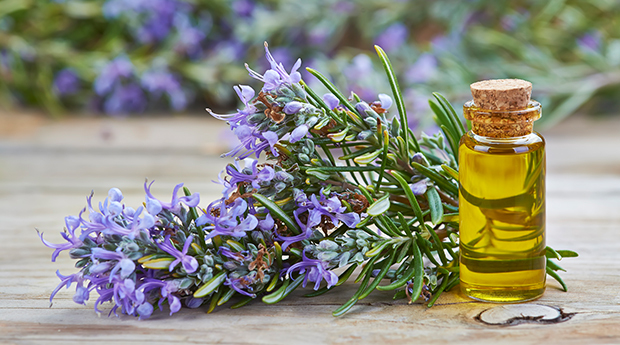 As an Essential Oil for Hair Growth, Rosemary Oil, when applied to the scalp, stimulates hair growth. It is believed that it can prevent baldness, slows the greying process, and is also used to treat dry scalp and dandruff.Mixed with other essential oils, it has some remarkable results, like an increase in rapid hair growth, promotes healing of the scalp, and improves the ability of hair to resist traction and a decrease in hair loss after shampooing. You can add the oil to your shampoo or conditioner and use it on a daily basis. Daily massage your hair with rosemary oil to stimulate blood circulation and new hair growth. You can also mix it with other essential oils and use it as a hot oil massage treatment as well for your hair and scalp.